25 million light-years away, the Messier 106 spiral galaxy shines in the constellation of Canes Venatici. 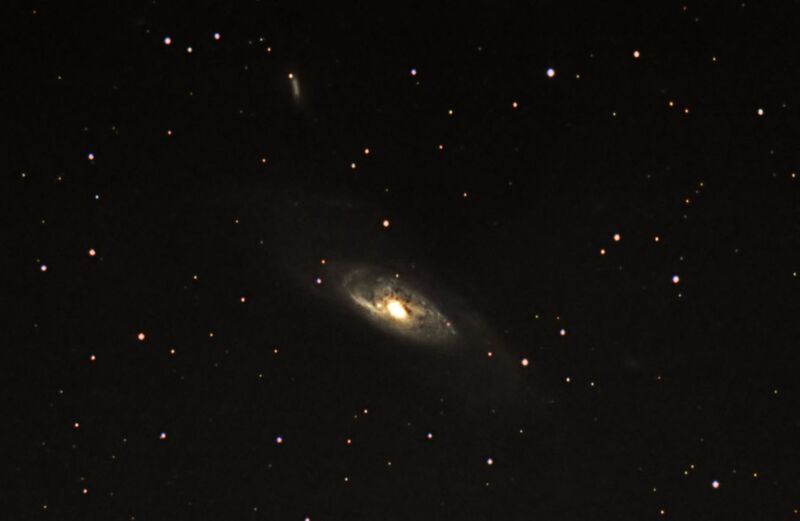 Like M31, the Great Galaxy in Andromeda, M106 is inclined towards us; however, the resemblance ends there, for it contains stars of a wide range of ages: blue regions for the youngest, yellow for the oldest. The most massive stars stopped shining a long time ago, as confirmed by images in the radio spectrum which show the galaxy to be bigger than what can be seen in the visible spectrum.